The meeting is a joint one with the Walton County Water and Sewer Authority, which actually holds the permit for the intake facility on the Apalachee River and is seeking approval from the U.S. Army Corps of Engineers for modification of that permit to accommodate the Morgan County site. The Morgan County Board of Commissioners has scheduled public comment on the intake facility at the front of its 5 p.m. meeting at the Administration Building, 150 East Washington Street in Madison. The Greater Apalachee River Community, which has organized in opposition to the intake facility and asked the Corps of Engineers to hold a Public Hearing on the permit modifications, is urging its members to attend both meetings. Elisha Brannon, Corps of Engineers project manager for the Walton County permit modification request, said on Friday that the Corps has not yet made any decision on the request for a Public Hearing. Oconee County Board of Commissioners Chair John Daniell had invited those concerned about the proposed Apalachee River intake facility to visit the intake facility at the Bear Creek Reservoir in Jackson County to see first-hand how such a facility operates. A dozen persons turned out on Wednesday night for such a visit, which included a presentation by Jimmy Parker, project manager for the Hard Labor Creek Regional Reservoir and a senior vice president at Precision Planning Inc., with offices in Monroe. Parker reviewed the history of the Hard Labor Creek Regional Reservoir and explained the role that the intake facility and water from the Apalachee River play in the project’s future. 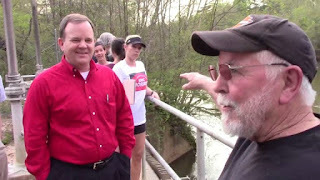 Those who did attend got a chance to walk to the Middle Oconee River to see the intake facility there used to pump water into the Bear Creek Reservoir. The reservoir is a joint project of Athens-Clarke, Barrow, Jackson and Oconee counties. The meeting on Thursday night was cancelled when no one was able to participate. About a dozen people attended the meeting on Friday night. “I will tell you that public hearings are very uncommon and are not very beneficial to the public as they are merely another means of formally submitting comments which we have already done, so the likelihood of having one is low,” Brannon wrote. “A public ‘meeting’ on the other hand sounds like what the public is desiring so they can voice concerns in an open forum, ask questions, receive answers,” Brannon wrote. Such interactions would not take place at a Public Hearing, she said. Editor Michael Prochaska, who wrote the story, attributed the information in the story about the decision on a public hearing to Billy E. Birdwell, a Corps spokesman. Parker told the group on Wednesday night that the existing reservoir in southeastern Walton County north of Social Circle can produce 16.6 million gallons per day of water, with Walton County entitled to 11.8 million gallons per day and Oconee County entitled to 4.8 million gallons per day. The reservoir at present obtains its water entirely from the Hard Labor Creek basin. To expand the capacity of the reservoir in the future, the two counties will need to pump water from the Apalachee River, thereby converting the existing reservoir to a pump-storage facility. The pump-storage reservoir would have a capacity of 52 million gallons per day, with 37 million gallons per day for Walton County and 15 million gallons per day for Oconee County, which is a 28.8 percent partner in the two-county project. The Corps of Engineers issued a permit to the Walton County Water and Sewer Authority in 2004 to withdraw water from the Apalachee River for the pump-storage operation. The Authority, which reports to the Walton County Board of Commissioners, is seeking to modify that permit to extend its deadline from 2019 to 2021 and to change the intake facility location. The permit at present calls for the intake facility to be on a 3.48-acre-tract on the Apalachee River in Walton County owned by Victoria Bracewell Presley. The intake was to withdraw water from the pool of a dam that provides water to a power plant downstream that is owned by Presley. Parker said the Authority’s attorney was unaware that the Federal Energy Regulatory Commission, which grants licenses for power plants, gives great power to the license holder over the flow of water to the plant. The Management Board, with four members from Walton County and three from Oconee County, forwards its recommendations to the Walton County Water and Sewer Authority. While most of the opposition to the intake facility on the 202 acres on High Shoals Road the Water and Sewer Authority has under contract has focused on the impact of the withdrawal on the river, some residents have voiced concern about the facility itself. Parker said that he didn’t think there would be any opposition to moving the pump building back from the river itself and said there already are proposals to change the exterior of the pump station building so it would blend better into the area. Parker said the Water and Sewer Authority only plans to use a small amount of the acreage and then put the remainder back on the market and sell it. Parker said he understands and shares the concerns expressed by the residents about the impact of the intake facility on the Apalachee River. Since the intake will withdraw water from the Apalachee River only when it has an adequate supply and will not withdraw water when the river flow is low, a pump-storage facility is a way to make maximum use of available water, Parker said. The permit that the Water and Sewer Authority holds is not for continuous withdrawal of water, but only for withdrawal when the river is high and only for use to supplement the Hard Labor Creek reservoir. Morgan County has asked the Corps of Engineers to hold a Public Hearing and has called for a public meeting of all involved to discuss the proposed permit modifications. At the meeting on Wednesday night, Parker, was asked what would happen if both the Oconee County Board of Commissioners and the Morgan County Board of Commissioners said they wanted the intake facility to remain in Walton County. The agenda for the Morgan County Board of Commissioners does not list any action to be taken following the citizen comment section. Commissioner Ben Riden, who represents the part of the county where the intake facility is proposed to be located, has been outspoken in his criticism of the project. The 202-acre tract under contract to the Walton County Water and Sewer Authority abuts the Riverwalk subdivision in Riden’s district. The video below was made by Penny Mills. It includes all of the presentation by Parker and two separate, short, clips from the tour of the intake facility on the Middle Oconee River. I did not attend either the Wednesday or the Friday tours. Oconee County Commissioner Chuck Horton did attend both and gave me the estimate of the number of persons at the Friday evening tour. OCO: Bear Creek Tour 4 11 18 from Lee Becker on Vimeo. The Oconee Enterprise left a phone message for Corps of Engineers Project Manager Elisha Brannon. Billy Birdwell returned the call and made it clear that there would not be a public hearing. One thing that The Oconee Enterprise took notes on but did not include in the story is Birdwell's explanation of what a public hearing would look like. According to him, if the U.S. Army Corps of Engineers held a hearing, representatives would hear the concerns of citizens but would not respond to their comments or questions. Birdwell explained that since citizens have already voiced their comments in written form, it would not be necessary to hold a hearing and that public hearings are rare.